rec. Abbaye de Noilac, Bruère-Allichamps, France, 23-27 April 2011. DDD. There are a number of recordings of the main work, the ‘Prolation’ Mass: from the Hilliard Ensemble (a Virgin Veritas budget twofer, 6284922), Schola Cantorum Stuttgart (4 CDs at budget price, Brilliant Classics 94267 – review but NB incorrect catalogue number given there, I think*), Musica Ficta (Naxos 8.554260) and a recording from the Clerks’ Group on ASV which is not generally available, though copies are offered online for as much as £55. It’s far from easy music to perform, owing to the considerable technical difficulties of the double canons on which it’s based, the ‘prolations’ of the title, and the ASV recording from 1996 was generally considered successful in bringing the technicalities off while sustaining the listener’s interests in the music. That’s always a problem with music of this complexity from the early renaissance, one that is shared with some of the music of Ockeghem’s disciple, Josquin, as in his mirror-canon writing in the Missa sine nomine and Missa ad fugam. The Tallis scholars provide an excellent balance between the virtuosity of the writing and the accessibility of the music in those two Josquin works (CDGIM039) and they have recorded two masses by Ockeghem (CDGIM035), so I’d like to hear them tackle the Missa prolationum some day. I haven’t heard the ASV version, so it’s a shame that it isn’t currently available, either in single-disc format or in the 5-CD box in which it once came. The Hilliard Ensemble version, however, thankfully remains available and theirs is the version to match. When it first appeared at full price on EMI Reflexe in 1989 it was regarded as an essential purchase for lovers of late medieval/early renaissance music and it’s even more so at budget price, coupled with Ockeghem’s Requiem, Missa mi mi and five motets, one of which is now no longer attributed to Ockeghem. It can be yours for even less by downloading from sainsburysentertainment.co.uk for £4.99. The Hilliards adopt slightly faster tempi than Ensemble Musica Nova, both in the Mass where they take 34:31 against 40:45, and in the two motets which are common to both recordings. Em Marshall-Luck was a little hard on this recording – review – finding a certain lack of imagination, colour, drive and incisiveness. For my money the Hilliards do demonstrate those qualities; in fact, they shape the line right from the opening Kyrie eleison beautifully and in that regard I prefer them to the new recording. Their diction, too, is clearer, though it’s an inescapable fact that the words are not always easy to hear in polyphonic music, one reason why both the 16th-century reformers and the Council of Trent sought to curb some of the more elaborate forms. Fortunately composers such as Palestrina and Byrd were able to come to terms with the new rules and still produce first-class music. I know that there are those who intensely dislike the u in words like Agnus Dei being pronounced in the French manner, as Ensemble Musica Nova do – we don’t know how it was pronounced in the late 14th-century, but it seems not unreasonable to use the modern French u. The Hilliards, on the other hand, though they employ a more open u, may offend others by employing a fairly hard gn rather than the Italianate ñ sound. Most listeners will take both in their stride. The Hilliard Ensemble’s recording may be over 20 years old, but it still sounds fresh, with a nice open acoustic, whereas that on the new recording sounds rather more enclosed and reverberant, though by no means muddy. Though that’s meant as a comparison rather than a criticism, you may expect me to plump firmly for the older, less expensive alternative. Certainly I doubt whether you would feel hard done by if you invested around £8 in that 2-CD Virgin set (or £4.99 on the download), but the advantages are not all one-way. 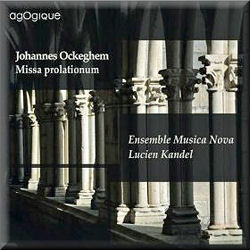 For a start, Virgin twofers are notoriously mean on notes and texts are non-existent and I gather from Em Marshall Luck’s review that the Ockeghem is no exception; with the download you won’t even get the skimpy notes that accompany the CDs. The AgOgique booklet by comparison – that’s how they spell their name, with upper-case O – is a luxury illustrated item, the kind of thing that you might expect from Hyperion, with scholarly notes on such matters as ‘mensuration canons’. You don’t have to read, much less understand, all that to appreciate the music, but it’s well worth having. Whereas the Hilliards give the music greater impetus, which I generally prefer, I can’t deny that there’s an attractive nobility to the music in the new performances. AgOgique quote a glowing review on their website which describes this recording as ‘une version de référence qui permet plus encore de découvrir la richesse de ce maître du contrepoint.’ I’d certainly go along with the second half – anyone listening to this new recording certainly has a good opportunity to discover the rich music of this master of counterpoint – without quite accepting the assertion that this is a benchmark or reference recording. That benchmark, for me, remains with the Hilliard Ensemble. If possible, listen to it from Naxos Music Library before making up your mind; their recording of the Agnus Dei from the Missa prolationum also features on an inexpensive EMI twofer, Essential Renaissance, which I reviewed some time ago. * two dealers’ websites give 94267 as the number.